A massive $19.2 million telescope array has just gone into operation in Antarctica and the rumor mill has it that the system's purpose it to track the approach of Planet X, or Nibiru, a mythological twelfth planet in our solar system that flies by Earth every 2,000 years, or so. One report said the system, mostly financed by the National Science Foundation with help from the Kavli Foundation of Oxnard, California and the Gordon and Betty Moore Foundation of San Francisco, is the size of a mini-mall. The telescope itself required a C-130 aircraft to transport pre-assembled modules and other parts to the site. But nobody working on the South Pole Telescope is looking for a wild planet that may be wandering into our solar system. The telescope and its highly technical equipment is designed to detect cosmic microwave background radiation (CMB), believed to be the afterglow of the Big Bang. The primary goal of the project is to learn more about dark energy, an antigravity force that exists throughout the cosmos. 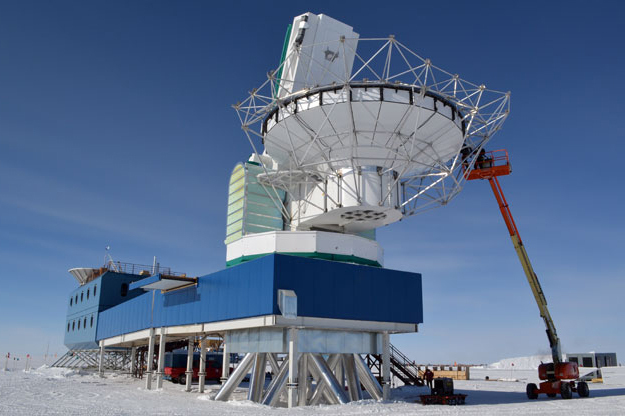 The telescope and its special equipment was placed near the South Pole to take advantage of the cold, dry air which, on clear nights, creates excellent viewing conditions. Albert Einstein first fostered the concept of dark energy. He perceived it as a steady force that was maintaining a stationary universe. That was the predominate idea among scientists in his day. Now, dark energy is thought to be an active force that is actually driving the universe apart. Some scientists theorize that dark energy varies in time and space. Others suggest that there is no dark energy at all. The Microwave Arisotropy Probe, an earlier high-tech telescope mounted on a spacecraft called Explorer 80, and launched in 2001, measures differences in the temperature of the Big Bang's remnant radiant heat. Since its launch, the probe, known as the WMAP, has sent home detailed images of the cosmic microwave background radiation, complete with interesting ripples that researchers believe are a record of the gravitational forces that created galaxies and galaxy clusters. The WMAP images have helped astronomers estimate the age of the universe at 13.7 billion years. The South Pole Telescope will be using something called the Sunyaev-Zeldovich effect. This is an image that distorts the view of the cosmic microwave background radiation as it passes through the hot gas of various galaxy clusters. Why is this something they want to look at? As one analyst explained: "As the microwaves interact with gas in the clusters, some of the microwaves get kicked into a higher frequency." The telescope "will measure the slight temperature differences and produce an image of the gas in the cluster." The research team believes such images will be a "snapshot" of the infant universe, before the stars and galaxies were yet formed. They will also help prove dark energy, and how it played a role in the formation of the universe as we perceive it. This is all highly technical, all-be-it fascinating stuff to learn about the amazing new South Pole Telescope. One thing we are quite sure is that these research foundations did not invest millions of dollars to build a telescope that grand to track a mythological Planet X. Sorry Mr. Sprat, the telescope on Antarctica is not something for us to be concerned about.